Keen to find a Dublin base, Deborah and Ultan Herr began searching for a property that was close to the city centre and could accommodate them and their three children. When the couple found a three-bedroom post-Edwardian property in Dublin in November 2012, it ticked all the boxes: it was within their budget, in walking distance of the city centre and a manageable size. The end-of-terrace villa did, however, require a huge amount of work to turn it into the comfortable and sociable home that they were seeking. The property was laid out in typical villa style, with a street-level front door and a reception room to the front. From the entrance hall, stairs led up to two small bedrooms and four steps led down to a kitchen and WC. Outside, at the back of the house, there were two sheds and an outhouse WC. The property had previously been lived in by an elderly lady and had been left untouched for years: it was damp, dark and dated, with no central heating, very little insulation and poor lighting. ‘We were excited at the prospect of turning this small house into something that would feel light and spacious,’ says Ultan. Find our how they achieved it, and then check out more real home transformations and find out all you need to know about extending a house. 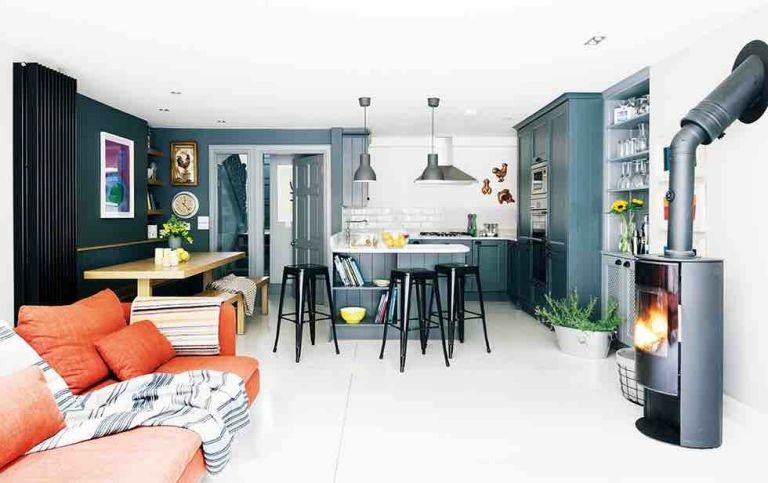 To make the most of the available space, the couple decided to knock down the back of the house and build an open plan, double-storey extension that would also allow them to enlarge the two bedrooms above. ‘It was a huge challenge: structurally, we had to carry out dilapidation surveys on the adjoining house, plus we had problems with drainage and the adjoining garden walls, one of which was about to collapse,’ says Ultan. They enlisted the help of architect Alan Larkin, who had designed their main residence, a Bauhaus-style coastal home. Before building work could start, the couple demolished the whole of the back of the house, with the help of long-time family builder, Aidan Murphy. Despite the level of work involved, the extension only took seven months to build. ‘We must have filled at least 30 skips and all the rubble had to be brought through the house; these terraced properties have lovely façades but they were cobbled together,’ says Ultan. ‘To give support to the walls and roof, we had to put in steel trusses – all this was supervised by my brother, who runs Padraig Herr & Associates civil engineers. We dry-lined all the walls and insulated the floors and ceilings. We installed a new condensing boiler, which is extremely environmentally friendly and super-efficient.’ Keen to remain faithful to the character of the house, the couple restored as many of the period features as possible. The couple demolished the back of the house, which incorporated a small kitchen and bathroom, and built a two-storey extension. A Morso wood-burning stove creates a focal point in the living space. Now at the front of the house, the master bedroom was originally the main reception room. The new extension has allowed the couple to open up the whole of the back of the house and blend the old and new, creating a spacious kitchen, dining and living area. ‘The breakfast bar, with light granite worktops, offers a space for casual dining and the large dining table is more suited for more formal entertaining, so it’s a very sociable and practical space,’ says Deborah. The full feature appears in the April 2016 issue of Real Homes. Subscribe today to take advantage of our money-saving subscription offers.